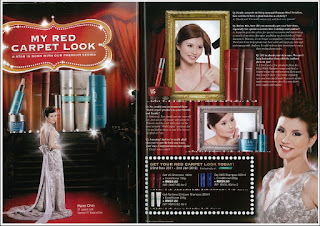 The Beauty Junkie - ranechin.com: Rane is the Watsons Diva! Actually the pictures were taken back in early October, by ImageRom crew. The entire studio was booked for my shooting and It was quite cool experience. More than 10 staff, including makeup artist, producer, art director, photographer, stylist, assistants were there with me for the shooting. Although there are only 4 pictures have been selected to be shown in Cleo, it took us more than 6 hours to finish! I felt really tired after the shooting but also felt thankful for such an amazing experience.